Inspired by the winding Avon river, this beautiful ceiling feature creates warmth and intrigue for arriving guests. 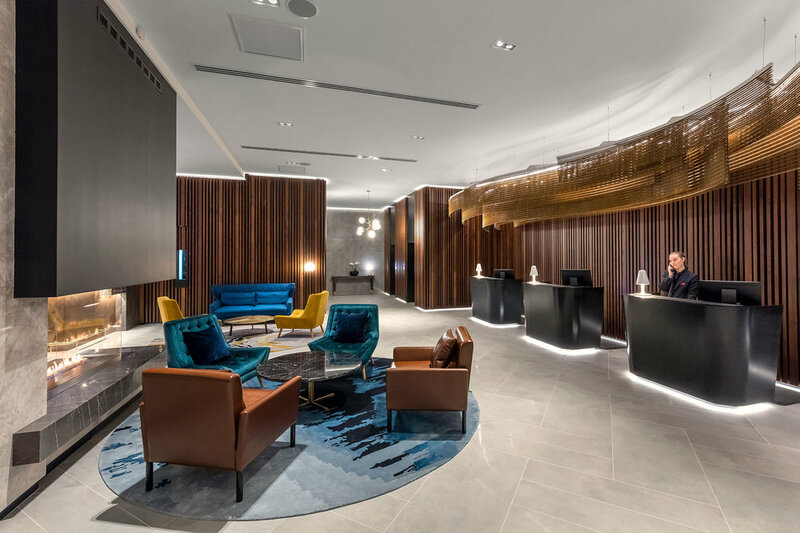 The new Crowne Plaza hotel in Christchurch is set to become a premium destination for international and local visitors to the rebuilt city centre. Repurposed from an office block tower the new development, with interior design by Designworks, is now the largest hotel in the city and has been developed to make the most of the 360 views of the city and the natural environment of the surrounding Port Hills and Southern Alps. Kaynemaile worked with the Designworks team to create the custom ceiling feature for the hotel lobby. Inspired by the winding Avon river, the Copper mesh ribbons are lit from above bringing a warmth to the space as guests arrive. Our mesh gives approximately 80% airflow through the cross sectional open area which means air compliant movement can be maintained in interior spaces as well as exterior screens. Kaynemaile is built on collaboration - we thrive on working directly with architects and interior designers to realise complex projects.